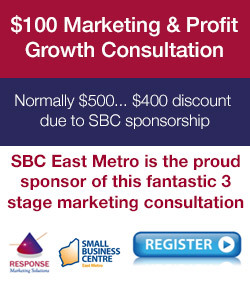 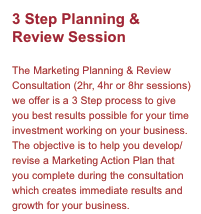 The Marketing Planning & Review Consultation we offer is a 3 Step process to give you best results possible for your time investment working on your business. 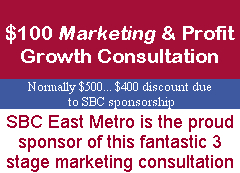 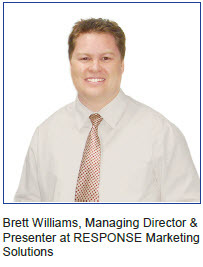 The objective is to help you develop/revise a Marketing Action Plan that you complete during the consultation which creates immediate results and growth for your business. 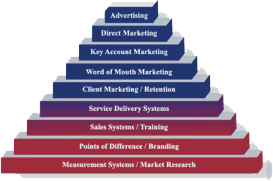 Step 1 – We provide you with a 181 point Marketing Audit questionnaire that reviews every aspect of the advertising & PR, direct & relationship marketing, word of mouth marketing, client marketing, sales process & systems, service, points of difference, research & measurement. 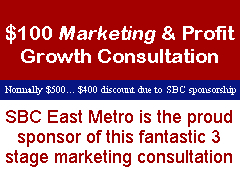 This tool alone is worth $300 and helps identify many opportunities you can action… before we even meet to discuss. Step 2 – After sending us your completed questionnaire, we review this and any other marketing tools or documents you have so that we can identify and prepare key growth strategies & techniques as well as refinements to your existing approach & plan. 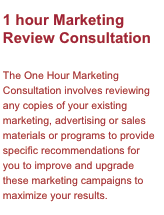 Step 3 – We meet for a 2 hour, ½ day (4 hour) or full day (8 hour) marketing planning & review consultation with you and any other key people you wish to be a part of the process. 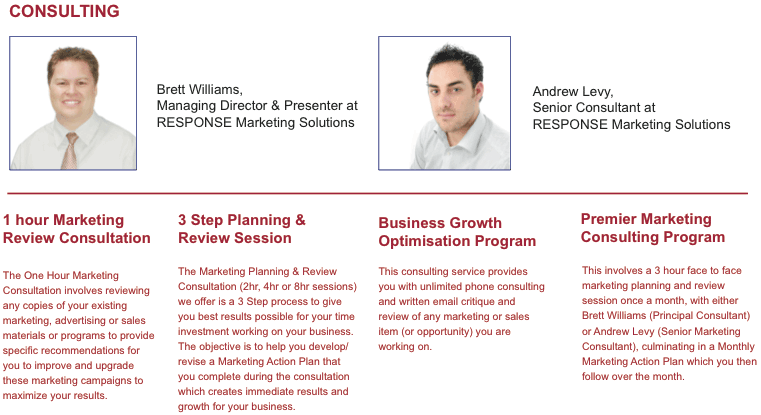 Firstly, we will review your existing/planned marketing approach to maximise the success of what you’re already doing/intending in all key areas of marketing, as well as outline a detailed tactical step by step approach for high growth strategies you have yet to tackle. 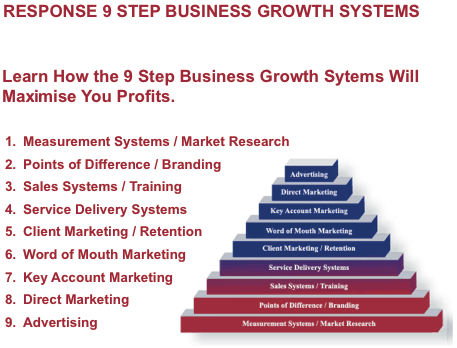 We will also identify how you can develop each strategy as an ongoing system that is documented and automated to continue its success each month and year to follow. 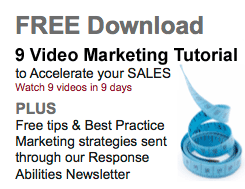 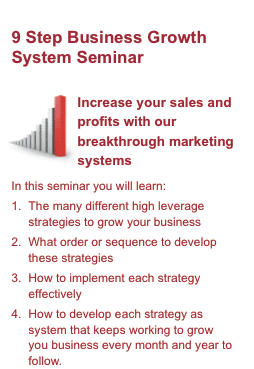 How you will turn your New Knowledge into Successful Results? 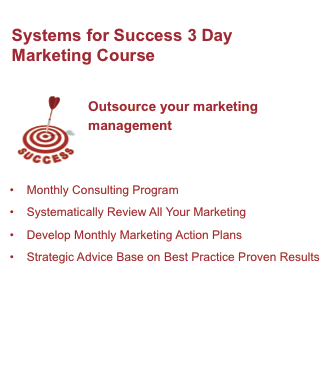 To turn knowledge into Effective Action, throughout this process you will complete a Strategy form for each item we discuss (outlines Objective, Strategy, Tactics, Timelines and Responsibilities). 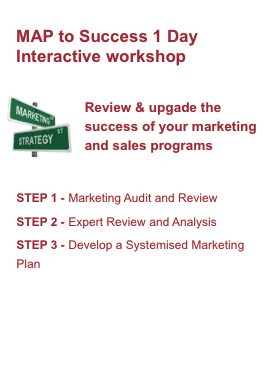 At the end of our session we will review each form to prioritise the order of implementation based on Return on Investment potential) so you have a detailed MAP (Marketing Action Plan) and you know when, what and how to action each system, straight away.